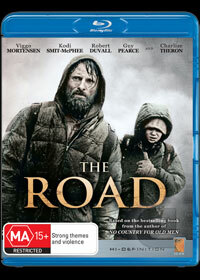 Based on the post apocalyptic novel by Cormac MaCarthy, The Road follows the journey of a man (Viggo Mortensen) and his son (Kodi Smit-McPhee) who are seeking solace in this devastated land by searching for precious water, food and more importantly, a safe place to live. As they travel along the road, they meet a variety of people from survivors to post apocalyptic savages that want their blood which makes certain parts of this movie quite intense. Directed by John Hillcoat (The Proposition), although Australian, at times it feels like The Road borrows heavily from first Mad Max film, however is a little more down trodden than the aforementioned feel because it's eerily real. It's difficult not to borrow on past films and movies because if the world was devastated by a catastrophe like this, it's more than likely that society itself would be thrown into a blender and then spewed out. The realness behind this movie comes from Mortensen, as a father who is desperate to save his son and the message is hammered home even more when we are given insights into their former lives, more specifically with his wife (Charlize Theron). Having read the book, I must commend the creators of the film for staying as close to the plot of the original book as possible and even though it may not be an inspirational film where the star wins supreme, the message is not lost and is extremely powerful. To compliment the story, the cinematography is visually quite impressive and helps recreate this dangerous post apocalyptic world as two individuals attempt the impossible. Add in some great performances by Robert Duval and our very own Guy Pearce, they make this science fiction thriller a very enjoyable experience. A special mention should be made to the very moody musical score that goes hand in hand with the story and on Blu-ray the video and audio quality is very impressive. Although it's dark and eerie, the quality is still there with deep black levels and excellent skin tones. Finally, we have some interesting extras that include the making of the film, some trailers and even a gallery. Definitely a movie to check out on a Saturday night.